A number of sportsman racers made noise over the weekend with outstanding performances at events all over the country. The double-header LODRS weekend at Great Bend, Kan. produced the majority of this week’s Top 10 as several racers made multiple final rounds and others made moves in the NHRA championship battles. The Division 2 LODRS at Silver Dollar Raceway in Reynolds, Ga. also produced some drama in the points chase as a couple of racers moved near the top of the national points with their final round finishes. But the biggest story of the weekend came from the IHRA Division 4 Summit Team Finals at Extreme Raceway Park in Ferris, Tex. where one racer claimed his third bracket finals victory in the last few weeks. Jake Howard – Just weeks removed from a double win at the NHRA Division 4 bracket finals at the Texas Motorplex, Howard captured his third bracket finals victory over the weekend at the IHRA Division 4 Summit Team Finals at Extreme Raceway Park, just a few miles down the road from the Motorplex. The most recent win gives Jake a total of 5, count’em 5, bracket finals victories in the last three years as he also won the NHRA Division 4 bracket finals in 2016 and 2017. The bracket finals is one of the toughest races to win as it sits high on every local bracket racer’s bucket list and the best racers from each division are in attendance each year. Jake’s run over the last month, and the last few years for that matter, is impressive for sure. He now has three chances in the next month and a half to pick up a national championship to top off his amazing year. 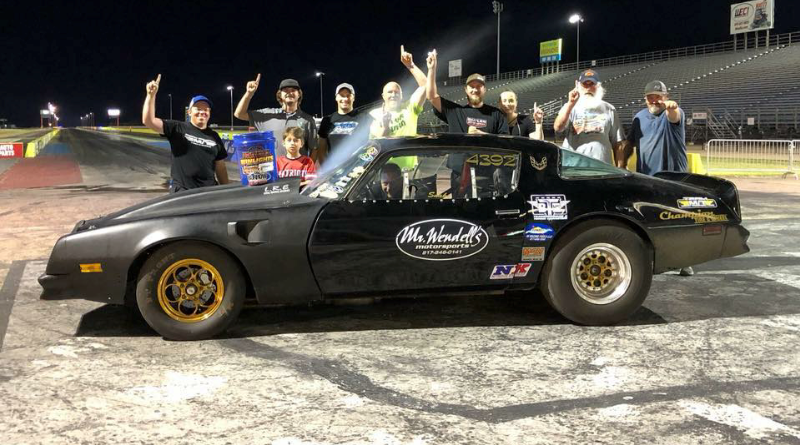 Justin Lamb – Justin made the long haul to the Great Bend Lucas Oil Drag Racing Series event in hopes of locking up his second-straight double national championship in Super Stock and Stock. While Justin still leads the national points in Super Stock, he didn’t put the championship away at Great Bend but he did all but lock up a second straight national title in his Stocker with a semifinal finish in the first event of the double-header. Justin’s current 689 points in Stock Eliminator leads his closest competitor by over six rounds which should be enough to hoist the championship trophy come November. David Rampy – Just a week removed from collecting national event win number 99, see video here, David drove to the win in the first event of the double-header which moved him in position to defend his national championship. Rampy sits just 22 points behind leader Frank Aragona who cannot improve his score. Rampy needs to improve on a 2nd and a 3rd round finish in his next two LODRS events to capture the points lead. Ray Miller III – Miller’s runner-up finish at the Division 2 LODRS this weekend catapulted him into second place in the Super Comp standings. Miller’s last two events have been a win and a runner-up which has left him in the driver’s seat in the championship battle. Miller sits 12 points back from leader Chris Garretson and needs to improve on a 2nd round loss in his next LODRS event to contend for the championship. Michael Miller – Miller had a busy weekend at Great Bend as he made a ton of rounds in both Super Comp and Super Gas. His best performance came in Super Comp as he made the final round in both events. On Friday Miller took runner-up honors to Mark Grame and on Sunday he reversed the outcome taking home the Wally after defeating the very same Mark Grame in the final. Mark Grame – See above and repeat here. Grame started off the weekend with a Super Comp victory over Miller and ended the weekend taking runner-up honors to Miller. These two guys put on a heck of a show in Super Comp. Rodger Sauder – Once again, see above and repeat here. Sauder put on a Super Street clinic in Great Bend with a win and a runner-up effort to put his name on the Top 10 board this week. Impressive for sure. Tim Nicholson – Nicholson has been a hot topic lately with his unique Super Gas combination. Tim uses a clutch assisted 4-speed in his ’67 Camaro with a top-end throttle stop which allows him to run 9.90 at around 100 mph. Tim’s definitely figured out his combination as he once again made the final round, he won the St. Louis NHRA National a couple of weeks ago, this time on Sunday at Great Bend. Although he settled for a runner-up, Nicholson moved up to 8th in the national standings. Chris Chaney – While Chris didn’t make the finals in Great Bend, his two late round finishes moved him into striking position of Justin Lamb for the Super Stock national championship. While Justin can still improve his score, Chaney and his wheel-standing Camaro, see video here, are still in the hunt for the championship. Chaney should finish out his points score in the next two weeks at the national event in Dallas and the upcoming LODRS in Noble, Okla.
Craig Bourgeois – With his Comp Eliminator victory at Silver Dollar Raceway on Sunday, the former world champ has put himself in position to challenge for the championship. Craig will need a late round finish in Dallas this week or the following week in Noble to have a shot at the championship. Most of the results this week were NHRA specific but I expect that to change next week as there are three $100k to win races this weekend at Rockingham Dragway. That should add a few bracket racers to the list next week. DragChamp is your source for sportsman racing news and results. Visit daily for the latest drag race results.